If you had never been to the Mediterranean coast, and had to create the ideal small seaport town from scratch, Sete would be it. The town is almost like a movie set, with its small pristine harbor, sidewalk cafes, lighthouse, canals and hilltop church. One would almost expect to see Cary Grant wandering among the art deco buildings or seated in a canal-side cafe sipping an aperitif. Sete is a small port on the southern coast of France that time seems to have passed by. Its size prevents the larger cruise ships from stopping there, and as a result, it retains a charm and an unspoiled quality (only the small ships of Windstar, Silversea and Radisson currently call here as part of seven-day western Mediterranean itineraries). It is a real working port, or actually ports, with the old port area in the southern end filled with pleasure boats and the small cruise ship dock, while the commercial port is out of sight on the other side of town. The Canal Royal is the focal point, as all major attractions and shopping areas are along (or within easy walking distance) of this central waterway. While Sete has some interesting attractions, the real pleasure comes in just being there, enjoying this relatively unspoiled French coastal village. Ships dock a couple of short blocks and across a small canal from downtown. The entire city is within easy walk of the pier. Sete is a great opportunity to people-watch. The town is compact, filled with small parks and sidewalk cafes, and the natives usually far outnumber the tourists. Place A. Briand is a nice setting to relax, surrounded as it is by busy shopping streets. For a less crowded venue, try the Parc du Chateau d'Eau, with its playground and war memorial. And for relaxing with a view, try hiking up to the top of Mont Saint-Clair. Alas, the French have not gotten into the habit of picking up after their dogs. Particularly on side streets, watch your step! On Foot: The entire town radiates from the old port dock, and except for a couple of spots up the rather steep hill, everything is an easy walk. 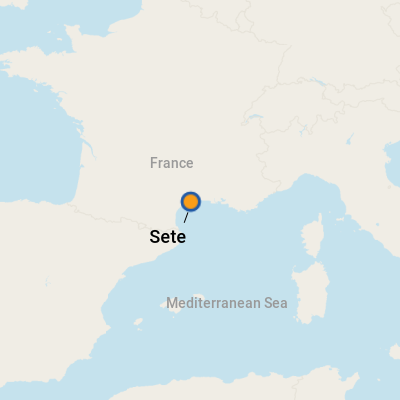 By Car: Hertz, Avis and Budget all have locations in Sete. Reservations are a must, and remember, the norm in Europe is the stick shift. Renters must request (and be prepared to pay a significant premium for) automatic cars. The euro; there are a few ATM's along the Quai de la Resistance and the nearby side streets. Shops outside of the main shopping areas often do not take credit cards. French. The city does not get many cruise ships, so while workers in the main shopping areas speak a bit of English, owners of the offbeat, and off-the-beaten track shops often do not. Casual Dining: The town is filled with small sidewalk cafes, and those located on the Quai Maximin Licciardi seem to be filled with locals. They offer similar menus that emphasize seafood. Pick the one with the fewest smokers, order the famous moules frites (mussels and fries as only the French can make them), pour some French wine, and enjoy the passing scene. Further up the same street (now the Quai de la Resistance), several pastry shops and bakeries offer dessert. Luxurious Lunch: For a more elegant (and expensive) meal, dine at La Rascasse (27 Quai General Durand, 04.67.74.38.46), a bright spot with a window-lined dining room and a few outside tables that take advantage of its location right on the Canal Royal. It features local and regional specialties (read seafood! ), a nice wine list, and opens for lunch at noon. Food! Specifically, either a bottle of the regional dessert wine, Muscat de Frontignan, or a box of macaroons or madeleines. These make nice gifts for the folks back home, too, as they are often boxed nicely and they travel well. A local specialty is an interesting biscuit created out of aniseed essence and thin slices of green olives -- ask for a sample before committing to a box, as they are unusual and may not be to everyone's taste.